Two years ago I decided to open the states first "compound only" pharmacy. Since then, MCP has been practicing pharmaceutical compounding in Missoula, Montana. As we begin to expand our business we look to the nation's medical community for support as we become recognized as an additional source for both the doctor and the patient. My professional experience as a pharmacist has been extensive. I received my degree at the University of Arizona and after graduating in 1970 I went to work with Thrifty Drug, Inc. In 1977 I opened my own pharmacy, during which time I continued my education through the University of the Pacific in Stockton, California. I also participated in special education programs with the University of Southern California where I served as a clinical instructor for the School of Pharmacy. I owned and operated Earl Neal Pharmacy in the greater Los Angeles area for 16 years and in 1993 I sold the business to make a lifestyle change. During the transition, I went to work for Savon/Osco Drugs for 3 years until 1996 when my family and I moved to Montana. Throughout my entire career, I have always enjoyed the practice of compounding medications. It is the prime reason why I have chosen to focus on customized pharmaceutical medicines. MCP is committed to providing the highest level of service. 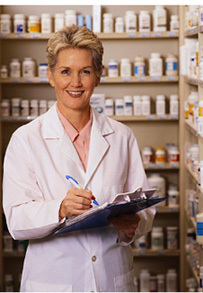 Our Pharmacists have built a mail order business that has worked with both the doctor and the patient. Reaching any patient is easier now due to the world wide web. We usually can deliver a prescription within a day. Our labs have created wonderful lollipops for tonsillectomy patients, suppositories and topical gels for patients who suffer from nausea, and hard to find injectable drugs that give impotent men new inspiration. We really believe in problem solving techniques and encourage your questions and comments. Whether you are a Patient, Veterinary Clinic, Dentist Office, or Doctor's group we can fill your immediate needs. Professional compounding is changing the way we take and get medications. The role of the pharmacist is also changing these days. With increasing competition from larger chainpharmacies, many pharmacists have returned to the early roots of pharmacy - compounding. Now known as "problem solvers", these pharmacist are really practicing an art; the art of compounding medications to meet each patient's and physician's unique needs. Having some trouble swallowing that "horse pill"? Montana Compounding Pharmacy can convert that hard to swallow tablet to a flavored liquid form. If you can't get the medication in half the dosage because you have a sensitive body, a 500mg tablet of antiinflammatory medication, for example, can be converted into different strengths as a capsule, liquid, and/or ideally an ointment or cream. As a community pharmacy we are always faced with competitive challenges with a new pharmaceutical practice model. As we educate our medical communities about the partnership possibilities with Montana Compounding Pharmacy, the patient becomes a true benefactor. The reward for servicing not only patients and physicians, but the community's need for such a niche market service, has become the fuel for our enthusiasm. Come visit us anytime to ask questions or to view our lab. Service Hours: 9:00 AM - 5:30 PM Mountain Time. Copyright © 2010 Montana Compounding Pharmacy, All rights reserved.